This is a deceptively simple book. It consists of a series of photographs of places and situations associated with various types and levels of authority, from school houses to prisons. The photographs are spare, most often without any human or sense of movement, and invite the viewer to regard these monuments in silence and solitude. They are as threatening as an execution room and as uplifting and humbling as a great mosque. They are from various places around the world, New York Police Stations, Mexican jails, Syrian railway stations, even the United Nations. Perhaps, most intriguingly they also include a remarkable series from Camp X-Ray at Guantanamo Bay. 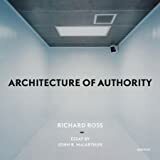 Ross, although he does write a short postscript essay and there is an informative and perceptive introduction by John MacArthur, generally leaves the photographs to speak for them selves. We, the viewer make the interpretations. We are invited to explore the symbolism of the settings. What does it mean to have no windows, or no chairs, or to be ornately decorated with sumptuous filigree? What are the messages inherent in the choices that are being made about how we demonstrate authority in (literally) concrete form? Ross knows that architecture is neither value-free not neutral. He knows that it is culturally mediated. He is aware that much of the authority he seeks to illuminate casts itself as benign (as in the case of his first photograph of a Montessori classroom). He knows that it will reflect the interests of those in power and is often intended to a monument to them. He leads the viewer to consider the consistent themes of a Foucauldian world of surveillance, from colonial Mexico to present day USA. He shows that the intent to "shock and awe" was just as relevant to the Crusaders who built Craq de Chevalier as those building the compounds in Baghdad. There are some understated, but significant features of the arrangement of the book. It begins with a pre-school and ends with the lethal injection room at Angola State Penitentiary, Louisiana (and anyone who has seen the film Dead Man Walking will not need any further clues). It is also dedicated to Joseph K., Kafka's quintessential human conscience. Like with so many of the details in the book, Ross presents these materials and silently moves away. This in itself is a meditation on the nature of photography and the role of the photographer. It may be a little disappointing for those with a psychiatric interest that there is only one photograph of a psychiatric institution (one in Cuba). However, we know that there are a number of excellent publications and interesting websites that do have that specialized interest, and a minor quibble should not detract from a beautifully presented, provocative and sensitive consideration of how we impose and demonstrate authority in the world. It should be highly recommended to all those with an interest in the representation of abstract notions in the real world.